The Steam Plant building in downtown Spokane is a restaurant and brewery and houses offices and store fronts as well, but the name is a remnant of an older time. The building was an actual functioning steam plant for 70 years according to their website. It didn't shut down until 1986. Renovated with a vision toward making the most of the industrial space, many elements of the Steam Plant's past remain which create a unique atmosphere. I know I'm sounding a bit like an ad for the Steam Plant here, but I have a soft spot for creative reuse, adapting to the surroundings and reusing old material in new and exciting ways, so I was thrilled by the aesthetics of the space. There's a lot of inspiration there! This is a corner in one of the side rooms of the building. I loved the abstract composition created by the girders and pipes and the way the lighter elements emerged out of the darkness. I worked my way across the page from left to right in order to not smear the paint (I'm right handed). Painting this was slow work, but worth it for the final result! Walking by, this caught my eye. I think it is the front of an old boiler room, but don't quote me on that. Now it is a window into a private dining room, wallpapered in thin pipes. The pipes that run down the wall here trickle water into a trough made by cutting a large horizontal pipe in half. You can see the fixture it ran through on the left size just above the table. Creative thinking with a great result! This is a sketch done in a long vertical sketchbook two years ago. Done while sitting on a window ledge of the Davenport Hotel (carefully avoiding their decorative spikes!) just before going to the Broken Mic poetry reading at Neato Burrito. The stacks of the Steam Plant are an iconic part of the Spokane skyline and I hope they always will be! Wolffy's is an old fashioned diner with great food and great prices, which makes it popular with all the nearby Gonzaga students! That was my first experience with the place. A friend of mine was obsessed with Wolffy's and went nearly every Saturday, so one day a couple of friends and I went with him. Good memories ensued, so I always have fond feelings whenever I drive past the restaurant. The restaurant has a really fun retro exterior. I had a lot of fun painting the neon lettering! I stopped in to sketch at Wolffy's around 11:30 am and the place was packed! It is a lot of fun to sit at the counter with other people-college students, construction workers, people bringing their out of town visitors...I'm so glad to see the restaurant is doing well and staying busy! I picked a spot at the counter in front of the grill so I could watch the action, even though I had to break the "seat spacing rules" of alternating empty stools. The fry cook was a wonder in action, cooking up multiple orders in a dance of spatulas and sizzle. A big basket of fries and a milkshake for around $7 is hard to beat, plus you get such great atmosphere. Get on down to Wolffy's and grab yourself a spot at the counter! A bit late thanks to an exciting trip down to the Southwest this past week. I went down for a wedding and decided to take the week with a friend and go to the Grand Canyon and Joshua Tree National Park. It was delightful! Please let me know if you'd like to see some of the paintings I made while on the trip even though it isn't paintings of Spokane! Now on with our regularly scheduled programming: The White Elephant! The White Elephant with its vintage lettering and proliferation of white elephants all over its building always makes me happy. I mean, who doesn't like cute elephants? A busy camping/outdoors and toy store (a combination that seemed odd to me originally, until I was won over to the White Elephant's ways), it saw plenty of traffic through its doors as I sketched the outside of the building from across the street. Why is there a swing set on the roof of this building? Who knows. Also, MORE elephants! This kiddie ride is a beloved toy for all children visiting the store. I saw several delighted kids ride it was I painted at the store. Spokane hosted the Individual World Poetry Slam last week. Poets came from all over to throw down for a chance to win the slam but there were also plenty of more casual slams happening around town as part of the event. Auntie's, Merlyn's, Boots Coffee, and Neato Burrito all participated along with the downtown library. I love how Spokane has a burgeoning literary scene-lots of writers and poets and it is attracting outside interest, such as this awesome poetry competition. 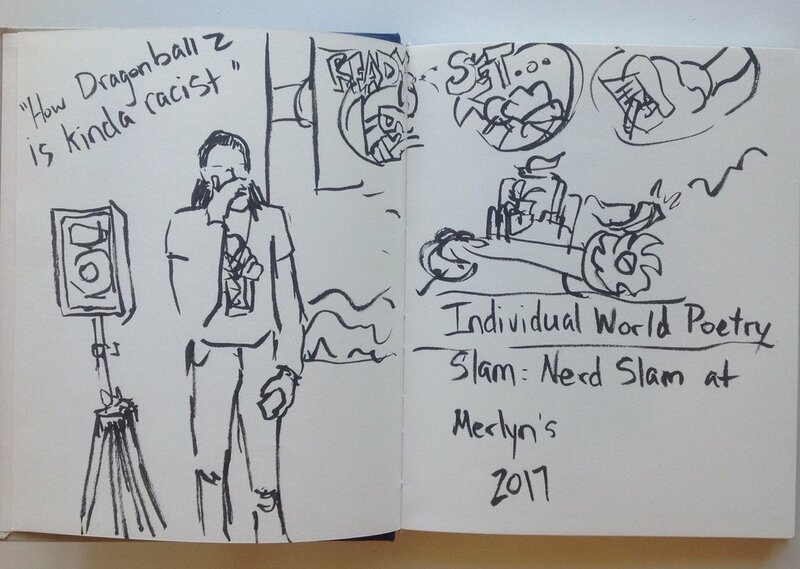 Merlyn's is a fun comic and gaming store next to the Saranac Commons, so a perfect spot for the "Nerd Slam". Each poet picked a nerd specialty and was asked a trivial question about their specialty before they performed their poem. It was really fun to see what people picked for specialties-Star Trek, Dr. Who, Westaros religions, Naturo and more. The time it took for each poet to think about the trivial questions gave me a chance to think about how I was going to tackle sketching them. Except for the cross spread title sketch at the end, I made each sketch in around 1-3 minutes. Challenging and fun! Gesture and body language was a big part of the performance. People are really into Game of Thrones, man. I thought it was interesting that all the poets that read their poem, did so off a phone, not a piece of paper. Loved the flower headdress and tinted glasses. Dr. Who was very popular. Poem about Stephen King horror novels. The rest of the writing reads, "I never would have gotten a Star Wars tattoo if I knew that it meant Geek Boys would touch me." This guy started off the event and I had a chance to sketch some of the background poster as the organizers were getting set up. If you want to go to some poetry readings here in Spokane, there's a weekly poetry reading/slam on Wednesdays at Neato Burrito and there are regular readings at Auntie's bookstore. Check them out. It can be a lot of fun! Every year, Native Americans from all over come to Spokane for the Gathering at the Falls Pow Wow, a competitive dance pow wow. I've been meaning to go to the Pow Wow for years, but the great thing about doing this Artist's Eye on Spokane project is that it gets me out there, doing the things I might never actually get around to doing. I watched this dancer get the final touches put on his face paint before he put on his feather bustle and strode off for the grand entrance. This feather bustle was resting on one of the fences while I sketched it. I think these are turkey feathers, but I'm not sure. The animal medallion in the center was intricately beaded. This sketch depicts one of several drum circles providing music for the dancers. Everyone is crammed so tightly together you can hardly see the drum, but their drumsticks were a constant waving rhythm. The fiery colors in the far right corner is an unused feather bustle resting in a blue wagon. One gentleman was drumming while on his cellphone! I wonder if the person on the other line could hear him at all? The frenetic energy and constant movement of the dancers made capturing them in action very tricky. I focused on the open, non-competition dances which were more about community and thus tended to be a little slower paced. As dancers came around toward me I would start trying to get them down on paper, finishing as they walked away from me, thus why this sketch is from the back. A fun side effect of choosing the open dances is the variety of regalia that everyone was wearing. At the Gathering at the Falls Pow Wow, the next Pow Wow royalty had to be chosen. These girls are giving their speeches about why they should get picked to be Pow Wow princesses. The gentleman dressed in red in the next images was one of two of what I think were the judges. Here's a little montage of my sketching over the afternoon. It was a hot day and a bit of challenge, but I'm glad I finally made it out to the Gathering at the Falls Pow Wow. The music, dancing, and regalia were all amazing!